Whether your estate is liable for federal estate taxes depends on the value of your gross estate, the amount of debt you owe at the time of your death, the total expenses incurred while settling your estate, and any deductions that your estate is eligible to take. 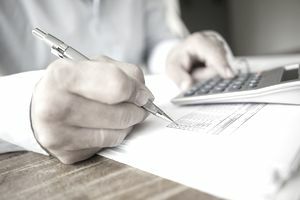 The process of calculating what your estate is likely to owe—if anything—might seem complicated at first glance but it's really just a matter of doing some elementary math. The starting point for determining your estate tax liability is the value of your gross estate. This is the total value of everything you own at the time of your death. You'll then subtract certain transactions from that gross total to arrive at the value of your net estate for estate tax purposes. Deductible debts include mortgages, lines of credit, personal loans, and credit card debt that you owe at the time of your death. You can also include funeral expenses and medical bills as well as administrative expenses to settle your estate or revocable living trust—things your estate will have to pay for. Administrative expenses include attorney fees, accounting and appraisal fees, storage and shipping fees, insurances, and court fees. Of course, you can't know what your administrative expenses will be yet, but you can arrive at a rough estimate by multiplying your gross estate by 5 percent. Subtract the overall total of these debts and expenses from the value of your gross estate. These include direct gifts and property set aside in a charitable remainder trust or a charitable lead trust. Most estates do not have these considerations. Subtract this total from what's left of the value of your gross estate after deducting your debts and estate expenses. Include outright transfers by right of survivorship and transfers made to a trust that qualifies for the unlimited marital deduction, such as the "A trust" that's established when you're using AB trust planning or ABC trust planning. Deduct this total from the remainder of your gross estate after subtracting your debts, expenses, and charitable transfers. This is your net estate. Now you can subtract your available federal estate tax exemption from the value of your net estate to arrive at your taxable estate. The federal estate tax exemption for 2017 was $5.49 million. It jumped to $11.18 million in 2018 under the terms of the Tax Cuts and Jobs Act. The exemption is indexed for inflation, which means it can be expected to increase incrementally from year to year. If you've made any taxable gifts during your lifetime that exceeded the annual exclusion from gift taxes—$14,000 in 2017 and $15,000 as of 2018—and if you did not pay the gift tax due on those gifts at the time, your available estate tax exemption will be reduced. It will be equal to the difference between the total exemption available less the value of your lifetime gifts that exceeded the annual exclusions. Let's say you die in 2018 and your gross estate is worth $8 million. Your allowable debts, expenses and other deductions are $500,000 so your net estate is $7.5 million. Your estate tax exemption is $3.68 million more than the value of your estate so no tax is due. Now let's use the same numbers but assume you died in 2017 when the estate tax exemption was much less. Your gross estate is still $8 million and your allowable debts, expenses and deductions are still $500,000. Your net estate is $7.5 million. Again, you would subtract your available estate tax exemption from your net estate to arrive at your taxable estate. If you have not made any taxable gifts during your lifetime exceeded the annual exemption amounts, your estate would owe tax of $804,000. Your taxable estate is then multiplied by the 40 percent tax rate to arrive at your federal estate tax liability, which in this example equals $804,000. Now let's use the same numbers in the first example but assume that you made $4 million in taxable gifts during your lifetime over and above the annual exemptions that were available to you at the time. The $4 million in taxable lifetime gifts must be subtracted from your available estate tax exemption. This leaves you with a $7.18 million exemption instead of $11.18 million. Applying the same 40 percent estate tax rate to your taxable estate, your estate would owe a tax of $128,000. This information is presented in a simplified format so you can calculate a rough estimate of your estate tax liability. It should not be relied on for legal or tax advice. Speak with a tax professional if you're concerned that your estate will owe a tax at your death.